For your baby’s overall growth and development, both mental and physical growth is important. In the primary phase of growth which spans from the first year of birth through five years, the baby grows rapidly. His physical and mental growth increase manifolds also, the optimal growth in the initial phase of life acts as the foundation stone for years to come. Your child’s future health, his academic success as well as his emotional, social and physical well being is dependent on it. Why is baby massaging important? While you take care of his internal health with sufficient nutritional foods, supplements, medicines and care, his external physical well-being demands equal attention. Massaging will help you in this regard. Massaging contributes a lot in terms of overall physical growth of your baby. Not only does massaging help you to bond with your baby but it also helps your baby to gain weight, improves his sleep quality, helps to develop bones, makes his muscles strong, relives digestive problems, stimulates blood circulation, detoxifies his skin and improves the metabolic rate. Thus massaging will not only help you to develop an emotional bond with your child but it will also help him grow physically stronger. Your newborn’s skin is highly sensitive so you need to be very careful of what product you are applying on it directly. Opting for an Ayurvedic oil over a chemically processed synthetic product is any day a wiser choice. Ayurvedic oils are made from a combination of natural herbs that have no harmful side-effects. These herbs have proven medicinal values which have multiple health benefits. 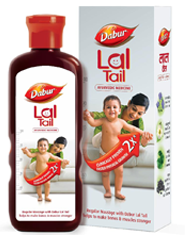 Dabur Lal Tail is an Ayurvedic Baby massage oil which is made from a combination of enriched natural herbs, selected and blended together carefully keeping its natural values intact. Dabur Lal Tail is made by strictly adhering to traditional guidelines on manufacturing of formulations and is 100% safe and effective. The oil nourishes your baby’s tender skin and keeps it soft and supple. It’s enriched natural ingredients cure and prevent the baby’s skin from getting dry or wrinkled.